Per Amber Alert reminds us that more pets get lost in the days surrounding the 4th of July than at any other time. The infographic includes simple tips for keeping our pets safe. 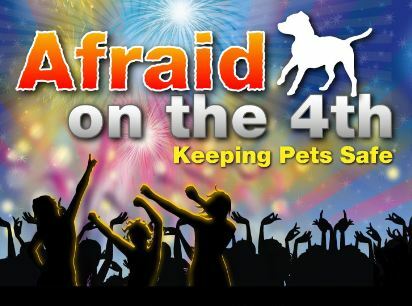 Whether the neighborhood teens are throwing firecrackers on your street… or your entire community is enjoying “the exuberant splendor” of a big fireworks display, your pet can become frantic and run away, trying to find a safe haven. More pets go missing around the 4th of July than any other time of year, and noisy fireworks are to blame. According to the national statistics, animal control officials across the country see a 30% increase in lost pets each year between July 4th and 6th. In fact, July 5th is one of the busiest days of the year for shelters. Here are 4 simple tips on how to keep pets safe… plus a bonus tip on how pet owners can have a better chance of finding a lost pet. 1) Stay inside: Try to keep your pet indoors at all times during holiday celebrations. Ideally, someone stays home with your pet. Also keep your dog leashed when going out for walks. 2) Make them feel safe: Comfort your pets with petting, hugging, talking to them in a soothing voice, providing a treat and staying nearby if possible. Make sure they can access their crate or “safe place.” Also ask your veterinarian or local pet retailer about natural calming products, anxiety wraps and other products that can help. 3) Avoid the noise. Try to drown out the fireworks sounds as much as possible by closing windows, playing music or turning on the TV. available today, and it’s wise to be proactive in case your pet gets lost. Among the various pet-finder services available, the Pet Amber Alert ID Tag/Pet GPS combines Amber Alert technology with a QR Code and pet GPS to help MORE lost dogs, cats and even birds return home safely. By following these tips, hopefully fewer families will face the heartbreak of losing a pet during the July 4th holiday.